149 pages, 8.5" x 11"
This volume by members of the Society for American Baseball Research (SABR) presents the 50 greatest games in Montreal Expos history. The games described here recount the exploits of the many great players who wore Expos uniforms over the years — Bill Stoneman, Gary Carter, Andre Dawson, Steve Rogers, Pedro Martinez, and others. The book details games from the earliest days of the franchise, to the glory years of 1979-81, the what-might-have-been years of the early 1990s, and the sad, final days. It describes the famous first game at Shea Stadium on April 8, 1969, when the Expos defeated that year’s eventual world champion New York Mets. It also details the first regular season major league game ever played outside the United States, when fans jammed little Jarry Park and began a love affair with the team. These game summaries don’t just retell the runs, hits, and errors. They give a context to the times and individuals involved. The article about Dennis Martinez’s perfect game also describes how he overcame his struggle with alcohol to resurrect his career. The piece about Curtis Pride recounts how he reached the major leagues despite the disadvantages of deafness, and what it felt like when 45,000 fans cheered as Expos coach Jerry Manuel spurred him through gestures to acknowledge the crowd. E-book: Click here to download the e-book version of Au jeu/Play Ball: The 50 Greatest Games in the History of the Montreal Expos for FREE from the SABR Store. Available in PDF, Kindle/MOBI and EPUB formats. 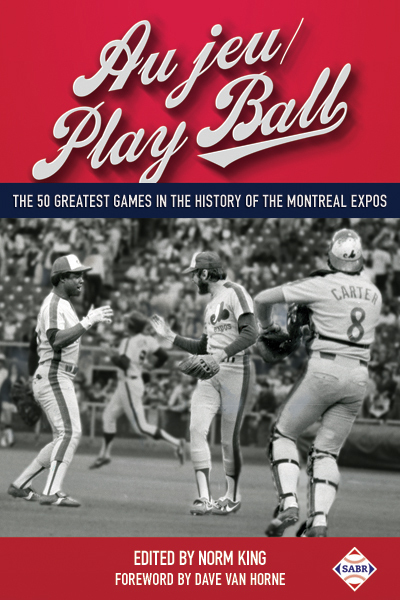 Paperback: Get a 50% discount on Au jeu/Play Ball: The 50 Greatest Games in the History of the Montreal Expos paperback edition from the SABR Store ($10.99 includes shipping/tax). E-book: Click here to purchase the e-book version of Au jeu/Play Ball: The 50 Greatest Games in the History of the Montreal Expos for $5.99 from the SABR Store. Available in PDF, Kindle/MOBI and EPUB formats. Paperback: Get the paperback edition of Au jeu/Play Ball: The 50 Greatest Games in the History of the Montreal Expos from the SABR Store ($20.99 includes shipping/tax). This page was last updated October 31, 2017 at 4:10 pm MST.